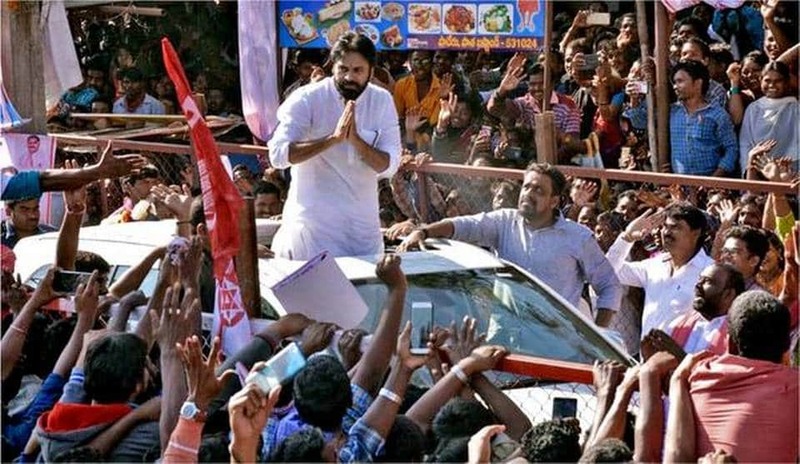 The TDP has betrayed the Girijans in the Agency area of the district and its rout in the elections is imminent, Jana Sena Party president Pawan Kalyan has observed. Tearing into Chief Minister N. Chandrababu Naidu, he alleged that the ruling party had let down the people – be it on bauxite mining, healthcare, or education. In the 2014 elections, I was under the impression that the State would be in the hands of an experienced leader. But I am disappointed, as the TDP government is steeped in corruption. That is why I walked out of the alliance. I will fight against it in the elections, the JSP president said. The JSP will provide an alternative to the people as it is founded by the common man and is not an entity inherited like the YSRCP or the TDP, which Mr. Naidu inherited after betraying his father-in-law, he alleged. Referring to illegal quarrying in the area, Mr. Pawan Kalyan alleged that the TDP leaders were involved in it. They were solely responsible for the environmental degradation, he charged. The TDP leaders involvement was indirectly responsible for the killing of the Araku MLA and former MLA by the Maoists, he said, and added that the party did not learnt its lessons even after the incident. Stating that he was opposed to all forms of quarrying in the Agency area, the JSP president said the government should instead focus on the development of the region. Healthcare is yet reach the people in the Agency area. Doctors are keen on serving in the tribal areas, but they complain about lack of facilities. If elected to power, I will build the required infrastructure. I am appalled by the state of the schools and hostels. The girls hostels do not have adequate wash rooms, and they are forced to answer the call of nature in the open. The hostels also do not have boundary walls and the inmates feel insecure. What is the government doing? he questioned. Referring to ganja cultivation, he said, We cannot curb it by arresting young tribal youth or destroying the ganja plants. The government should focus on establishing a Tribal University, building infrastructure and providing jobs. Employment offers solution to all the ills, and it will be my focus area. I will will focus on the tourism sector too as it is a major employment generator,” he said, and vowed to take up the Girijans cause like revolutionary freedom fighter Alluri Sitharamaraju. Alluri Sitharamaraju fought for your rights, and I will follow in his footsteps. I will not allow you to be divested of the natural resources that you own constitutionally. The Australian Prime Minister too had apologised to the natives of his country for the atrocities committed in the past. But in our State, you are still being exploited. I have included this in my manifesto. I promise that the day I come into power, the first thing I will do is to apologise for the mistakes and crimes committed by the earlier governments, he said.